For more than 40 years, IBM® mainframes have supported an extraordinary portion of the world’s computing work, providing centralized corporate databases and mission-critical enterprise-wide applications. The IBM System z®, the latest generation of the IBM distinguished family of mainframe systems, has come a long way from its IBM System/360 heritage. 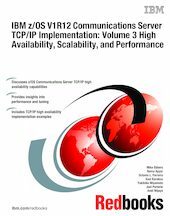 Likewise, its IBM z/OS® operating system is far superior to its predecessors, providing, among many other capabilities, world-class, state-of-the-art, support for the TCP/IP Internet protocol suite.